After reading Our Prince of Scribes, I learned that Pat Conroy wasn't JUST a wonderful author - more importantly, he was a wonderful person. He was a teacher, a mentor to many new authors, a friend to many and just an all around great guy. When Pat Conroy died in 2016, the world lost a man who had written several wonderful books and who had a control of the English language like no one else that I've ever read. The authors who contributed to this book all talk about the impact they had on their lives - whether they were new author friends or friends for 50 years. Edited by Nicole Seitz and Jonathan Haupt, the contributors to this book are a diverse group of people - Pulitzer Prize winners Rick Bragg and Kathleen Parker; Grammy winners Barbra Streisand and Janis Ian; Lillian Smith Award winners Anthony Grooms and Mary Hood; National Book Award winner Nikky Finney; James Beard Foundation Award winners Nathalie Dupree and Cynthia Graubart; a corps of New York Times best-selling authors, including Ron Rash, Sandra Brown, and Mary Alice Monroe; Conroy biographers Katherine Clark and Catherine Seltzer; longtime Conroy friends Bernie Schein, Cliff Graubart, John Warley, and Walter Edgar; Pat's students Sallie Ann Robinson and Valerie Sayers; members of the Conroy family; and many more. 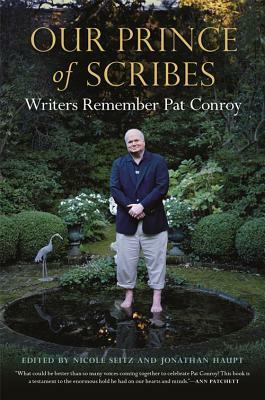 Nicole Seitz, the editor of this book as well as a fantastic author, set up the essays in this book based on Pat Conroy's life. This book will make a difference in the next book that you pick up -- if you haven't read Pat Conroy, you'll realize what you've missed and know that it's time to start reading his books. If you are a Pat Conroy fan, this book will make you want to take your copy of Prince of Tides or Beach Music off your shelf and travel to the low country and get reacquainted with those characters that you loved. NOTE: In 2017, the Pat Conroy Literary Center was opened in Beaufort, SC. It is full of memorabilia of his life - the desk he wrote at, his father's flight jacket, lots of pictures and other items from his life. I stopped in Beaufort on a trip to Savannah last summer with the sole purpose of going to the Literary Center and it was well worth it. The displays were wonderful and the docents were attentive and answered every question I had, even though I am sure that they've been asked the same questions over and over. Here are two pictures from the Pat Conroy Literary Center. If you are ever near Beaufort, SC, it's a great place to visit plus Beaufort is an absolutely beautiful city.